The traditional gender binary of boy/girl often leaves me feeling trapped between buying pajamas decorated with yellow dump trucks or pink hearts and frills. 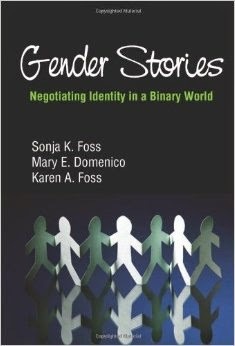 Gendered Stories works under the assumption that each person's gender is as unique as the collection of stories that composes our lives. Gender is omnirelevant, so it is communicated through everything. You operate a piece of heavy machinery AND you are male or female, neither or some combination of the two. You bake a soufflé AND you are male or female, neither or some combination of the two. This book tries to give you the tools to construct a more deliberate gender, one that doesn't simply succumb to the impossible-to-meet binary that is imposed on us by traditional Western civilization. It definitely does a good job of dislodging the binary as the only way to see gender. Not only gender, but many frameworks in Western civilization are positioned as polar opposites: thin/fat, light/dark, rich/poor, oppressed/liberated. And in these pairs, one is always valued over the other. This suggests that in order to break away from sexist stereotypes, we need to break out of the binary all together. This doesn't seem as impossible as it first might if we look at historical construction of gender. "Human bodies were not conceptualized as two opposite forms (male and female) with two sexual orientations (heterosexual and homosexual) until the nineteenth century." As anatomists learned more about the human body, the more they were convinced that "the female body was simply an inferior version of the male body." How do we do break out of the binary? The first way is to appropriate pieces of gendered stories that work for us. The more deliberate we are about what we internalize, the more agency we will have. The second way is through our performance. More obvious aspects about how we present ourselves such as clothing and hairstyle are included in our performance along with more subtle such as tone, posture, and gesture. The third way is to continually adjust our performances to the responses we receive. My critique of the book is that it is very post-structuralist. Some readers may remain unconvinced that gender is intractable from genitalia. And I do think that the authors downplay the very real intersection between biology, societal expectations, and our own choices of how we present ourselves. They do this because they want to empower readers to construct their own gender. And to be fair, they do give a nod at the end of book at how difficult it can be to change habitual behavior. So while I would like to see more interplay between determinants and choice, the book certainly offers a distinct alternative from the traditional binary. One of the things I really like about the book is that it uses a whole bunch of specific examples of how gender can intersect with other aspects of your identity such as a women wearing baggy clothing and speaking in a low register or a young man afraid to be affectionate in front of his boyfriend's parents. Because there are so many specific examples, I find it likely that readers will be able to find some description they can relate to. On the other hand, as a textbook, I would have liked to see more exercises with the explicit intent of helping students reflect on their own gender identities and give them the structure to experiment with those patterns of behavior. The drink I recommend to pair with this text is the Gender Bender. Traditionally served with brandy and Jack Daniels, you can also just mix cranberry juice and pineapple juice for an unusual but tasty treat.